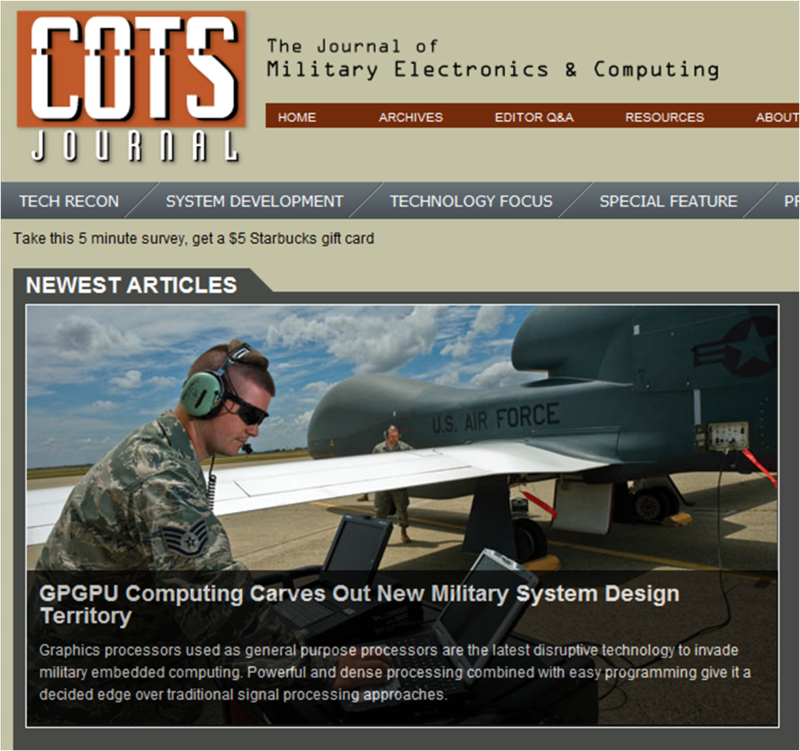 Partial screenshot of the COTS Journal main homepage. This month's issue of COTS Journal - a publication dedicated to military technology applications, gave special emphasis to GPGPU as "the latest disruptive technology to invade military embedded computing." Since GPU computing for military applications is one of our areas of expertise, we were invited to contribute to the Special Feature article Carrier Landing Modeling Systems Leverages GPGPU Computing. The article provides a great overview of how GPUs have become a well-suited platform for data-intense military applications. The part of the article we contributed for discusses the development of GPU-accelerated Computational Fluid Dynamic (CFD) solvers that can accurately model aircraft landing scenarios on naval vessels. This is a challenging project because we're modeling scenarios in which small moving elements interact with larger moving structures. Talk about extremely complex scenarios and data intense computations! When John and his team were working on the proof of concept for this project, they were able to accelerate a solver for Euler equations by 54x. This means reducing the solver's compute time from 18 hours to 20 minutes, which is pretty significant. What they are facing now are computations that can consume 150,000 CPU hours to run! How many GPUs and CPUs will it take? Check back with us in a few months as we're just getting started on this Phase II project. CUDA 4.0 was released to Registered Developers recently, and so we are getting many questions about the CULA release schedule for CUDA 4.0. As you may know, each release of CULA is tightly tied to a particular version of CUDA. CULA R11 will be released next week and will be the final CULA release based on CUDA 3.2. We have gone over many of the new features for R11 in this blog post, so I won't repeat them here. These new features come, as always, with speed improvements and various other improvements. The big question is when you can expect a CUDA 4.0 build of CULA. CULA is passing all of our testing on CUDA 4.0 and is ready to go! We are merely waiting on the final CUDA 4.0 build to go to full public release. Why not release now? Since CUDA is a private/beta release presently, we cannot package into CULA the necessary files from the CUDA toolkit, so users of this release would need to be registered developers themselves with the proper version of the CUDA 4.0 toolkit installed. And the intent of this period is that NVIDIA can release updates as often as they deem necessary, and we would need to update CULA for each of those. CUDA 4.0 is essentially a moving target for right now. But rest assured, a CULA release will be available very shortly after CUDA 4.0 goes public! Meet Yu Tian, a Financial Mathematics PH.D. student from Monash University in Australia. He is a member of our CULA user community and is being highlighted here for his contributions in the field of high performance computational finance. 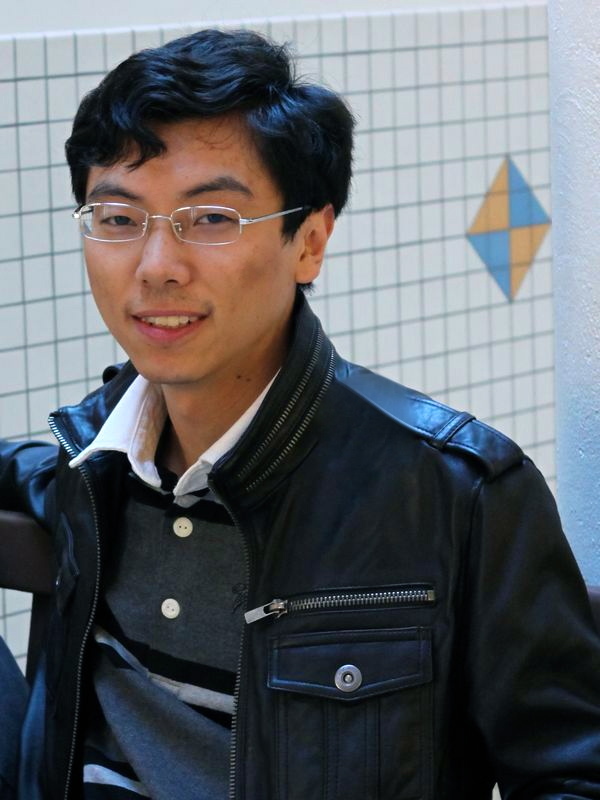 Last year, he and his colleagues published a paper entitled "Option Pricing with the SABR Model on the GPU." He explained to us that in the world of computational finance, the most popular areas of research are centered on: 1) new financial models, and 2) novel computational methodologies to solve models more efficiently. His research is focused on the acceleration of option pricing models leveraging state-of-the-art techniques and technologies such as GPUs. Modern option pricing techniques are extremely complex, but allow financial analysts to calculate the value of a stock option with tremendous accuracy. These models involve many linear algebra routines, such as CULA's Singular Value Decomposition function. "We used the SVD function in CULA Basic in a least squares problem to solve an American option pricing model and were able to achieve a 4X speedup," said Yu Tian. "Now that we have a supercomputing center at our university, our plan is to get the full version of CULA for all GPU nodes and do some research on calibrating complex financial derivatives models." We're wishing Yu and his colleagues at Monash University best of luck in their research! What is your experience with CULA? If you'd like to share, please contact us.